To apply filtering to a data source, click the Filter button in the Data Source tab. This will invoke the Filter Editor dialog, which allows you to build filter criteria. To learn how to work with the Filter Editor, see the section Filter data via the filter editor in the Search and find in projects topic, in Use filters section. To clear the data source filter, use the Clear Filter button in the Data Source tab. 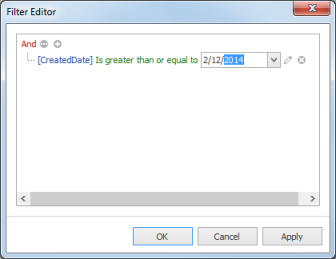 You can use the Filter Editor to filter a data source according to the current parameter value. To learn more, see the Passing Parameter Values topic. The limitations of a data source filter are as follows. Fitering cannot be applied to a data source created in SQL View. You need to include the required conditions to the WHERE clause when editing a data source. OLAP data sources do not support filtering. Data source filtering - InLoox • Copyright 1999-2019 © InLoox, Inc. All rights reserved.